Emotions can frequently fog one’s judgment in MTG finance. In fact, the same is true for stock market investing. Emotions explain why stocks and Magic cards can be over-valued and under-valued in the short term. However I am in the camp that the Invisible Hand finds the correct price…eventually. It may take months or even years – but I firmly believe that over a long enough time horizon, fundamentals outweigh emotions. 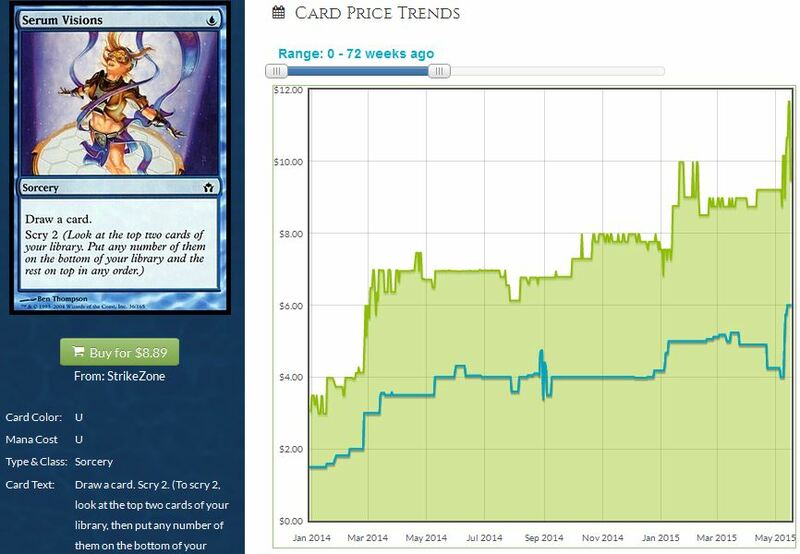 The true value of a stock or a Magic card will be reflected in its price over enough time. Take for example the recent Twitter drama I caused by pointing out the low stock of Promo Command Tower on TCG Player. At the time, there were approximately seven copies in stock across five sellers. I purchased three copies and highlighted to the community how few remained. In rapid fashion, the remaining copies were bought out, sending this card’s market “value” much higher. Disgruntled players criticized me for pointing out this shortage of stock, wrongly accusing me of a pump and dump or at the very least, market manipulation. I tried to explain that the true value would be identified given enough time, and that any short term spike was artificial. Well, here we are a month or two later and Judge Promo Command Towers are back down to $28, only about 15% above where I bought my copies. It took a while, but the Invisible Hand eventually did take action to regulate the market and help identify the right price. The above example to me is a classic case study showcasing how markets can overreact due to emotions. The result is a brief moment in time where market inefficiency could be exploited for profits. While I did not make such a greedy move with Command Tower (I still own the same three copies), there are other short term opportunities that are worth considering. With Modern Masters 2015 on everybody’s mind I thought I would take a look at some reactions to being either included or excluded from the set. In certain cases, we will be able to identify emotionally driven price changes. Perhaps there will be some situations where rampant sell-off could soon generate a buy opportunity. Conversely, cards dodging reprint may have overreacted to the upside creating a chance to sell into hype. Let’s start with a couple cards that have sold off dramatically since being spoiled in MM2015. The first card that comes to my mind almost immediately is Leyline of Sanctity. The Core Set rare has dropped nearly 40% since being spoiled in the reprint set. This reprint was a major hit to the white enchantment. But my outlook isn’t such extreme doom and gloom. The card is still a clutch sideboard player in a metagame where Burn is relevant and even dodging Thoughtseizes and Inquisition of Kozileks (two excellent pickups, by the way) is quite handy. That being said, the card went from very low supply to…marginally higher supply? Think about it: will Modern Masters 2015 have a long-term impact on the supply of this card? Could an increase in Modern interest help drive demand, supporting this card’s price in the future? It’s certainly possible. My advice: keep an eye on this one – it’s selling off now and for good reason, but activity over the last day or two may suggest there are buyers at this lower price point. Once it stabilizes, Leyline can be a solid target. Spellskite is another such example. Like Leyline of Sanctity, this is another highly relevant sideboard card in Modern. After peaking over $30, the card rapidly sold off and crashed down to around $15, only to recently rebound back over $18. This is another example where the market is emotionally over-reacting to news. Will Spellskite’s price continue to drop? Possibly. But much of the drop is likely already priced in at this point. I’d keep a close eye on this one as well because as long as Splinter Twin remains dominant in Modern, this will be a highly in-demand card with plenty of fundamental strength. Don’t give in to short term panic selling if you can avoid it. 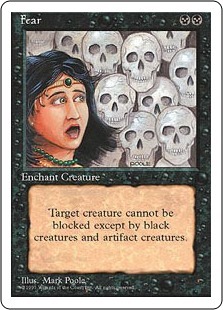 At this point you may be thinking only sideboard rares are experiencing this emotional sell-off. Guess again. The most valuable card in Modern, Tarmogoyf himself, is also selling off in light of Modern Masters 2015. While his pullback has not been as drastic, a move from $220 to $171 is nothing to sneeze at. In this case, I suspect the selling may not be over just yet. But the bottom will arrive swiftly. And when it does, it will likely last for only a brief moment. 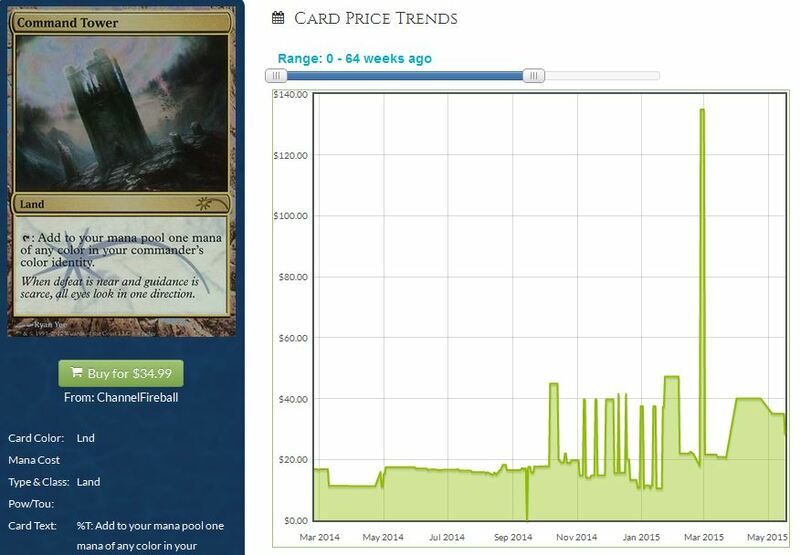 If history is any indicator, we may see Goyf’s price recover almost as quickly as it drops. Let’s zoom in on June 2013, when the first Modern Masters was released. 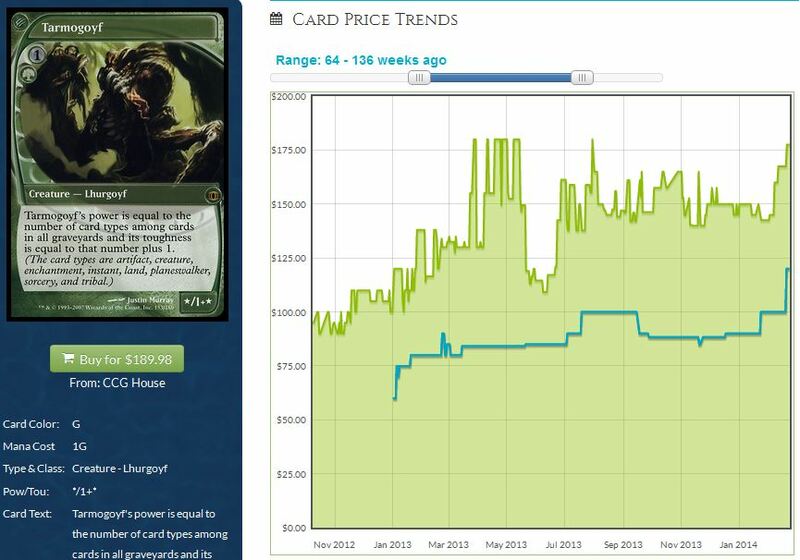 We can see in the chart above that Tarmogoyf peaked at $180 in 2013, only to drop down to around $110 in light of Modern Masters. Less than a month later, however, the card recovered nearly 100% of its drop. 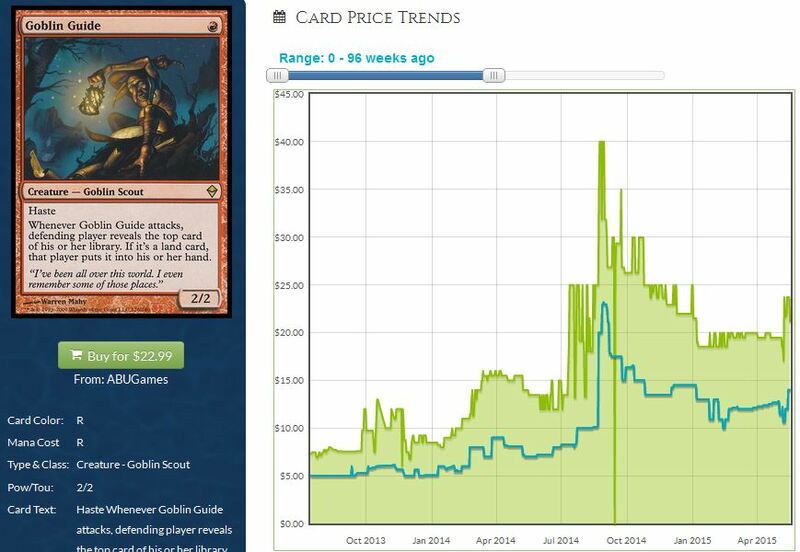 By early 2014, Goyf recovered the full price drop and started to set new all time highs. 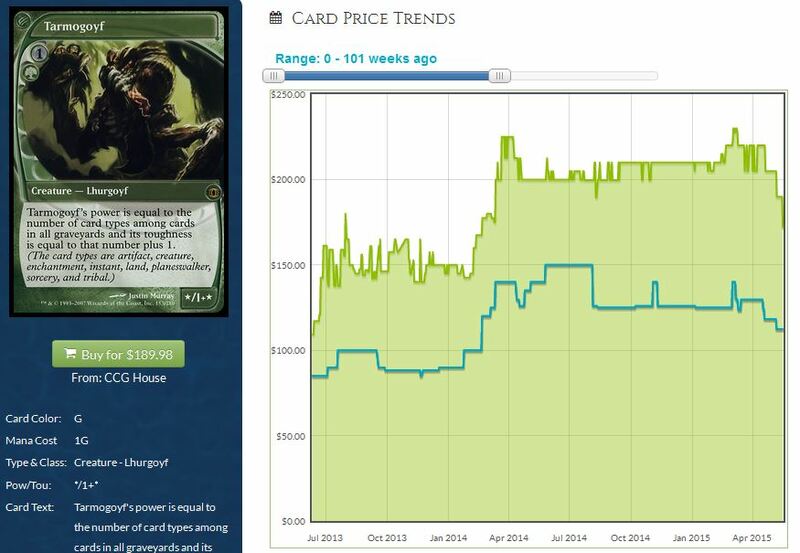 Using this data, I suspect we haven’t hit the short-term bottom on Tarmogoyf just yet. But we need to remain extremely vigilant. A major price drop out of fearful selling could generate the best opportunity to make short-term profits. The same theory will apply to other reprinted cards like Noble Hierarch and Mox Opal. These two cards have also sold off dramatically since being spoiled in MM2015. A short-term selloff will again be a terrific time to obtain copies. We just need to be very careful with our timing – when the panic selling is over we need to be prepared to acquire quickly. The window of opportunity may be very small. It’s no secret a few obvious exclusions were made from Modern Masters 2015. Cards dodging reprint in this set are bound to move higher in price. However in some cases emotions took cards into overbought territory, meriting a short term pullback. Inkmoth Nexus is the poster child for such overly enthusiastic buying. 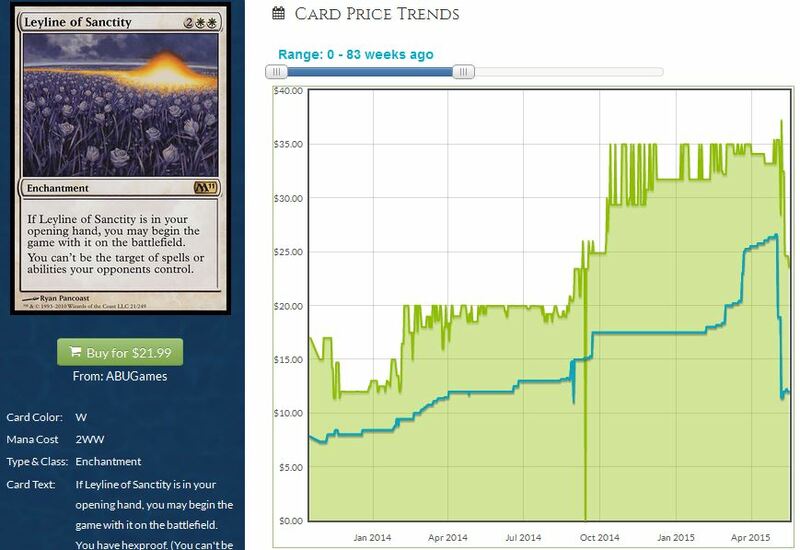 The nonbasic land skyrocketed 100% after we confirmed it would not be reprinted in Modern Masters 2015. I suspect this is driven highly by speculators, although it’s possible that some players held off on acquiring copies they needed in the hopes of a reprint. But you can see how the card over-shot to the high side in recent price action, and since the peak at $25 it has actually dropped 20% back down to under $20. The euphoric buying has subsided for now, but I’d watch this one closely. Another surge back to $25 is not out of the question, especially since the top buy list price hasn’t budged from $15. If we get back to $25 again I’d advocate moving extra copies to take advantage of everyone’s bullishness on the card. Goblin Guide is another card worth a closer look after dodging reprint. I want to highlight how much more subtle the price jump is in Goblin Guide. He went from $18ish to around $24, only to sell back down to $21. While less drastic, the trend matches that of Inkmoth Nexus. Emotionally driven buying by speculators and players who recognized cheaper copies won’t be entering the market any time soon, followed by an ensuing sell-off. If there’s another surge in the coming months, make sure you’re ready to pounce. Selling into emotional hype is the best way to maximize value from your cards when looking at a short-term time horizon. The last example I want to cover is Serum Visions. When news broke that the blue sorcery dodged reprint it shot up to $11.66. Euphoria was short lived however, as the card quickly pulled back to $9.45, not even $1 above its pre-hyped price. Yet again we see this same trend – overextended buying followed by an immediate pullback. Should this price behavior happen again in the coming months, I’d be ready to cash out of excess copies. Not only does this net you higher gains, but it also ensures you dodge future reprint risk, such as an FNM Promo in the case of Serum Visions or perhaps a Battle for Zendikar appearance (Goblin Guide? Inquisition of Kozilek?). In the three examples I shared of cards overextending to the high side, I want to point out one important consistency. In each case, the card value jumped on emotional excitement only to pull back immediately thereafter. However in all three cases, the top dealer buy price did not drop alongside the value. They all jumped up and have so far been able to stick. If this trend continues and buy prices remain elevated, it will provide very strong support for these cards. Therefore, before cashing out in future price jumps, I’d highly encourage you to inspect buy price trends first. It’s one thing if speculators are getting a little too enthusiastic about a card’s absence from MM2015. It’s a completely different story if dealers also join the fray. In cases where buy prices jump and remain higher, you may be best served by holding for a longer time horizon. Either way, one must be very observant of trends over the next couple months. There will continue to be rapid price fluctuations as people overreact to market changes. Should prices seem to overextend either to the upside or downside, we need to remain vigilant and prepared to act. If a sell-off becomes overdone, the window to acquire cheaper copies may only be open for a couple weeks. In the case of rampant buying the window to capitalize is even smaller, lasting only a few days. We’re entering a highly volatile time period in MTG finance. This isn’t the time to sit on inventory complacently. We need to be acting if we wish to maximize value from our collections, adding positions where appropriate and cashing out of others after a spike higher. Perhaps the best strategy shortly after Vegas is to move spiked cards into reprinted cards – selling high and buying low. It may be challenging to move cards that everyone is euphoric about into cards that everyone is dumping. But if you time things correctly you’ll be selling into hype and buying into fear, the perfect trading strategy if you ask me. Lastly, if you’re truly too afraid of how low prices can go on reprinted Modern staples I urge you to at least consider moving overbought cards into more stable holdings. Cashing out of overpriced Inkmoth Nexus at a dealer, taking trade credit, and acquiring that Dual Land you’ve needed for your EDH deck could be one of the best decisions you’ll ever make. This is especially sound advice if you don’t want to actively manage your MTG portfolio throughout Modern season. No matter what you do, keep your emotions in check. We should use historical data from the first Modern Masters to try and anticipate where prices may go from here. With a little planning, we just may add incremental value to our collections simply by timing things right. Good luck to everyone! While everyone knows about Inkmoth Nexus and Serum Visions, a few cards that dodged MM2015 reprint have remained under the radar this past week. Here are some cards worth keeping an eye on and possibly acquiring before the hype train leaves the station. While it was printed in the first Modern Masters, there’s no Rift Bolt in MM2015. The result: this $2 common is poised to rise in value as long as Burn remains relevant in Modern. Star City Games has a dozen or so copies in stock across Time Spiral and Modern Masters, but keep an eye on dealer stock going forward. We could see some gradual, more sustaining price increases this summer. There will be no Spell Snare in MM2015. I suspect this will mean stock of this card will be dropping in the next few months. Star City Games currently has just one Dissension copy in stock at $5.59, though they have 17 MMA copies at $5.65. Picking up these – perhaps even in foil – could lead to some gradual price gains throughout 2015. Another solid target due for gradual price increase is Hive Mind. The blue enchantment has seen only one printing, back in Magic 2010. The card is relevant in Modern, and may see some casual demand as well. SCG has 11 total copies in stock, with NM pricing at $4.89. This seems very low for a card played in Modern as a 3-of or 4-of. If Scapeshift can be a $24.15 card on SCG, I don’t see why Hive Mind couldn’t move higher from here. 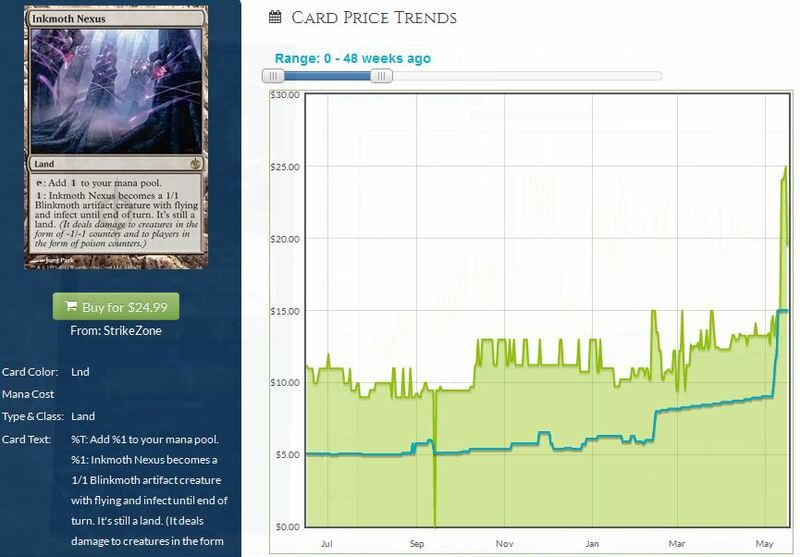 I haven’t been able to find a source where I can lay out all the price trends of mm1 value fluctuations without clicking on the individual cards, but it seems like with a few cards aside, most cards printed at the rare slots, or cards with healthy appreciation set by non-competitive play were destroyed even by the extremely limited print run of mm1. With this in mind, I’m not sure if cards like Spellskite, Hierarch and Leyline can ever recover (I don’t think they will tank, but they are more likely to drop and not recover to pre mm2 prices than to bounce back with full force) The scariest part of mm2 is the unpredictability of its print run and the innability to predict the influx of new interest like the influx we saw during the summer of mm1. I do think it is a good idea to buy after vegas and play into the fear, but I don’t think the people who dumped reprinted cards that kept their value largely on low (leyline, fulm mage etc) supply/print did anything irrational. Thanks for the comment – I think there is certainly merit to your points. 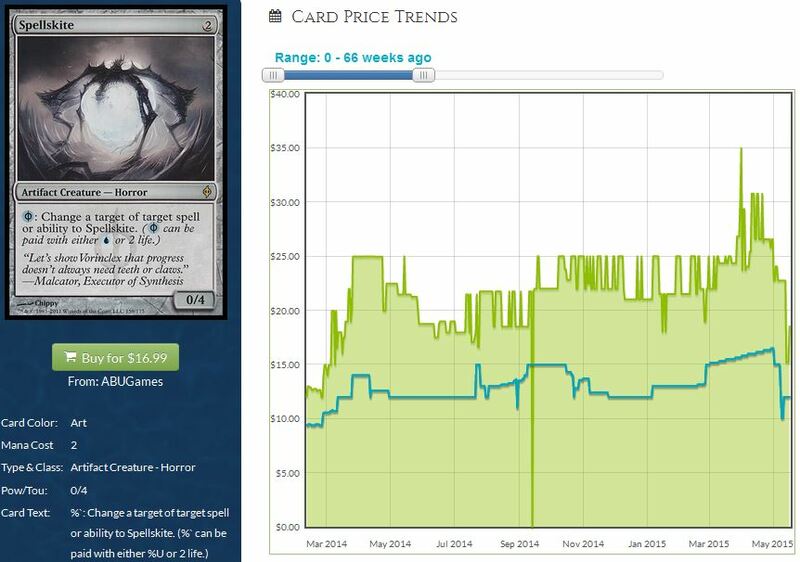 The prices of all the MM2015 rares WILL take a hit, of that I am certain. But I can’t help but wonder if the market will over-react to the negative over a short-term basis. For example, perhaps people will be willing to “fire sale” their reprinted cards in trade at an LGS. Or you may find someone list copies of their card for an abnormally low price in response to the news. These are things to keep an eye out for, because I DO suspect we may over shoot to the downside and then slowly recover. Don’t get me wrong, it’s not like Leyline will tank to $5 and then suddenly bounce back to $20. But I could see the curve showing modest recovery after the initial sell-off period passes. If the cards are good and played enough, they’ll find price support and eventually recover, at least partially, from lows. I’m advocating that we be on the look-out for these opportunities. It’s a great way to sum of the eventual justice to economy, more often than not, settles at the correct price after a panic. The advice on cashing out to a playset for Serum Visions is perfect advice. Dumping them all could leave you up the river without a paddle forcing a potential loss of profit if you have to buy back in to play them or fill your binder/case (due to a increase in demand). I’m curious about the future of Inquisition. The overpriced event deck did nothing to drop it’s price. and MM2015 didn’t give it any extra reprint love. Battle for Zendikar give a little hope, but no Bird of Paradise in Return to Ravnica and no Leyline reprints (even if it was a bold spec) in the enchantment-filled Theros block shows WotC never misses a chance to avoid the obvious when it comes to reprints. Enjoyed the article! Keep up the good work!